Exactly what I thought the first time I heard someone say LuLaRoe. What is this craze that women are going gaga over? I have a few friends that swear it changed their lives. Me, being the Yoga Pant wearing mom that I am, thought I am not sure about all the crazy patterns or if I was a LuLaRoe kind of person. Now let me tell you, I was curious. I won't deny it. But then I was offered the chance to review a few of the products and I jumped on the chance. I want to see what the madness taking over the U.S. is all about. Why do women go gaga over the leggings, shirts and dresses? What is it about LuLaRoe? So I received my package and inside was a pair of leggings and an Irma shirt. At first I looked at it and thought, I don't know if I can pull off this shirt? It's a pattern I typically wouldnt really wear. However, after opening the individual packaging, I stuck my hand inside to give a good feel and yes I now I understand why these women go crazy! The material has to be made from heaven, because it is the softest material I have felt. I ran around the house asking the boys to give it a feel and even they were amazed at how soft the leggings and shirt was. Well who cares about the pattern now, I am going to pull it off and I am going to be the most comfortable mom on the soccer field doing it! 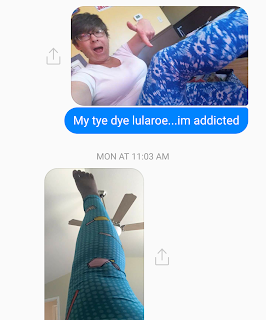 I had ordered a pair from the LuLaRoe Representative before my package came, because lets be honest, I work from home, I like to be comfortable and they were cute. So of course now that I have the Review package, oh its on! I am addicted. I can only describe it as complete comfort. You almost forget you have pants on. I mean they melt into your skin, like butter. You don't want to take them off! You want a pair for every day of the week! With all of the style options available and new ones always coming in stock, well lets just say you can either go with simple or wild and fierce. Be bold! Be you! Don't let what other people hold you back. If you like crazy patterns to represent who you are deep down inside, then you wear the crazy bold patterns! Because LuLaRoe brings that out in you! If you like dresses, there are a few different styles to choose from. There are a few different styles of shirts, and even children apparel that you can create matching outfits with the little one! Mommy and Me day, I don't think my boys would go for it though. However they do offer Men's shirts too. Kristen Madren has been a huge help for me and this is who I have purchased another pair of leggings with anticipation to purchase more in the future. Forget the Yoga Pants, I don't even do Yoga! But I can LuLaRoe! Leggings cost approximately $25 a pair, which in comparison to a few pants I have bought at Old Navy for so called "yoga" it honestly is worth the price. They do offer a Buy 10 & Get 1 Free rewards program as well. So if you become addicted, like myself, then this may be a great program for you! Thank you so much for your perspective on the LuLaRoe clothing and giving a shout out to my wife, Kristen. We have come a ways since you wrote this and have even added a website! I will shamelessly through it in the comments. Thanks Zach! I am still a LuLaRoe addict thanks to Kristen and am so happy for the success you both are having. Now I may share the website with all of my friends and hopefully readers. I bought these to run in and they stay up, didn't have to pull them up. The stylish workout clothes are on the heavier side and the black color were not see through. I tend to favor the darker colors and will look to buy more.